ZERO GLARE DES2 + UV! NATURALLY PRODUCED BY THE SUN, WHATEVER THE SEASON USED IN FLUORESCENT LIGHT BULBS. 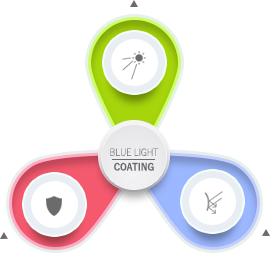 Blue light is part of visible light and close to UV on the light spectrum. 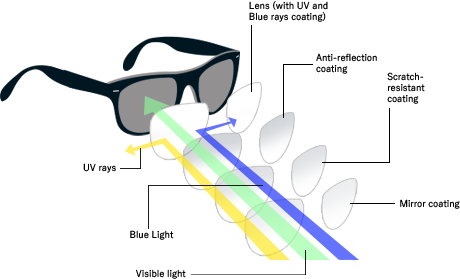 Naturally produced by the sun, emitted by leds present in computer screens. Because their lifestyle is more exposed than adults to light. Their eyes are not yet fully developed, so they are less protected fromt the harmful effects of UV and Blue-Light. Children tend to spend a lot of time outdoors: On average their annual UV exposure is 3 times higher than for adults. Children’s pupils are larger, meaning they let in more UV and Blue light. 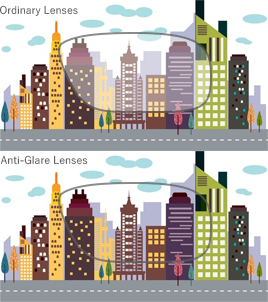 Their crystalline lens is more transparent, meaning it is less efficient at filtering out UV. Anti-reflective coating (also called "AR coating or anti-glare coating") improves vision, reduces eye strain and makes your eyeglasses look more attractive.